I begin this letter with some hesitation, because I know you were a teacher once. Nothing I say here should be new to you. So why would I ask you to take the time to listen? It’s because I talk to teachers every day. They share their thoughts on social media, in the comments they leave on my blog, and in private emails. I see how many of them are struggling. Some are engaged in a healthy struggle, the “good stress” of working at a challenging job. If we think of teacher stress as a continuum, I would put these teachers at the healthy end. At the other end, the struggle has a different character, a kind of desperation that goes beyond “good stress.” Teachers at that end of the continuum are panicked. Many nights they go home and cry. They don’t sleep. They can’t concentrate. And they are thinking seriously about leaving the profession altogether. After listening to thousands of teachers tell their stories, I have reached the conclusion that there is one deciding factor that determines where teachers will fall on the continuum, one element that makes the difference in whether the teachers in any given school will lean toward positive and productive or desperate and crushed: That element is the administrator. 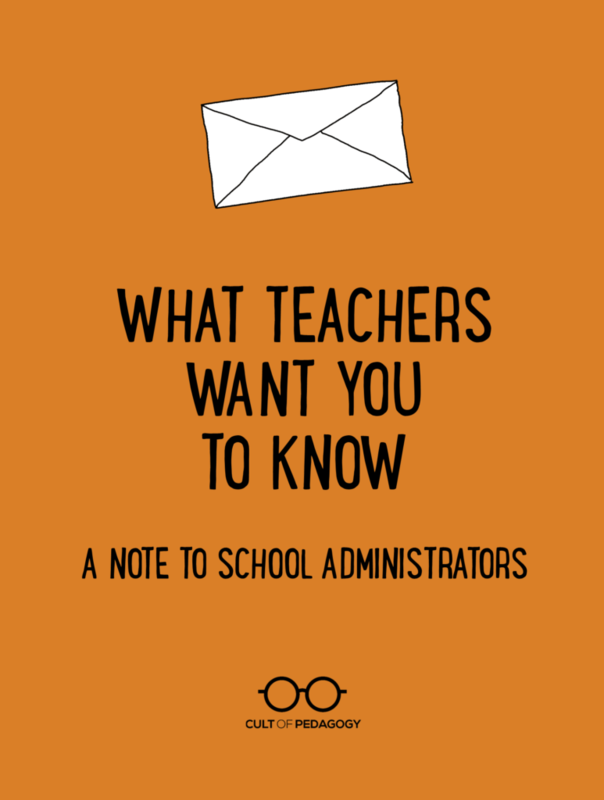 Behind every teacher story is an administrator who is interpreting policy, setting expectations, and establishing a tone that will determine the quality of their teachers’ work, and by extension, the education their students receive. If too many teachers are drowning at the unhealthy end of the continuum—and our current teacher shortage suggests that this is the case—then too many administrators are tolerating, or creating, unhealthy working conditions. Administrators who may have forgotten what it’s like to be a teacher. Most of us will never fully understand the difficulty of your job, the pressures from parents, community members, central office, students, and teachers. How mandates are passed down without your input. How things like safety and the budget weigh on you. The dozens of decisions you make every hour. How you protect your staff in ways they will never know, how you do things for kids that no one ever sees. We forget how, unlike when you were in the classroom and had plenty of colleagues to vent to when things got tough, you are now mostly alone. How you miss out on so much of the good stuff: Because you’re constantly putting out fires and making sure the ship keeps sailing, you don’t get to experience so much of the joy of educating young people. You don’t have time to really get to know kids, to make memories with them and impact them in small ways all year long. We don’t often consider the fact that despite doing your very best, you always have to disappoint someone. Most of us will never sit behind an administrator’s desk, so when we consider how your actions impact us, we would be wise to remember that we can never truly understand all of your decisions because we don’t have your responsibilities. With that said, there are a few things your teachers would like you to know. I’m taking the liberty of speaking for them here because many don’t feel free to speak for themselves. But if they felt comfortable telling you, they would probably ask you to consider one of the following five things, five actions they wish you would take to help them become the best teachers they can be for the students you all serve. If you’re already doing these things, then you’re probably not the intended audience for this letter. Also, your teachers probably love you like crazy. But if you’re not doing some of them, my hope is that you’ll find something here to reflect on as you work to move your staff closer to the healthy end of the continuum. 1. Treat teacher time as a precious commodity. It is so easy to believe that you already respect teachers’ time as much as you are able to, but I’m asking you to consider this with fresh eyes. If your school is like most, it’s already set up to give teachers very little time without students present—maybe an hour a day at most, and in some cases, much less. In that time, teachers are expected to plan engaging lessons, assess student work, provide meaningful feedback, contact parents, make photocopies, collaborate with their colleagues, design instructional materials, meet with students to provide extra help, troubleshoot technology programs, display student work, maintain a relatively interesting and tidy classroom, enter grades into a centralized grading system, and complete various kinds of paperwork. That’s the baseline, the normal expectations. And it’s clearly more than any human can handle in the time allotted, which you know, since you were a teacher and you’ve been there. You know that they are already taking work home and putting in evening and weekend hours just to meet the standard expectations. So when you make decisions that take more of that already scarce time away from teachers, it’s soul-crushing. It forces teachers to make the choice between bringing more work home or just not doing it: The lessons become less engaging. The feedback gets less meaningful, more robotic. The paperwork comes back late. The collaboration gets postponed, again. Time is a finite resource that can’t be recovered once it’s lost, and although your teachers might still show up, the quality of their instruction is what’s ultimately going to suffer. Here’s a metaphor I heard from my own principal years ago: Think of a teacher’s workload like a backpack. They already have a lot loaded in there, and as more things get added, the backpack gets heavier. Eventually, you just can’t get anything else in; there’s simply no more room left. When you’re thinking about adding anything else to your teachers’ backpacks, make it your policy to take something else out: An old requirement that doesn’t really make sense anymore, an administrative task that might be handled by someone else or dropped altogether. When forced to choose between the new thing and the old, this kind of policy will help you choose more carefully. Drastically reduce meetings. Meetings kill an insane amount of time: all-staff meetings after school, team or department meetings that gobble up whole planning periods, last-minute meetings, meetings that run over time, meetings that don’t apply to everyone in attendance. It doesn’t have to be this way. It doesn’t. But the only person who truly has the power to change the status quo is you. You can refuse to accept meetings as a necessary evil and commit yourself to reducing the time teachers spend in meetings by as much as possible. Start by cutting your regularly scheduled meetings in half: Instead of meeting as a staff once a week, see what happens if you switch to every other week. Do the same with teachers’ team, grade-level, or department meetings. Then try replacing some face-to-face meetings with cloud-based ones using a tool like Voxer, which allows you to have group voice chats anywhere, at any time. Finally, look for ways to shorten the meetings you do have: What business can be handled ahead of time, so you don’t have to spend as much time discussing things in the meeting? And what steps can you take to make sure you absolutely, always end your meetings on time? An extra five or ten minutes makes a world of difference when you’re talking about rush-hour traffic and picking kids up from daycare or after-school activities. It’s a big deal, so make this one a non-negotiable. Guard instructional time like a Doberman. How often are classes interrupted by all-calls on the P.A. system or buzz-ins from the office? These may seem like no big deal, but if a teacher has just gotten students focused and is finally getting somewhere with a lesson, even the briefest interruption can send things off-course for several minutes. Do whatever you can to limit these interruptions. On a macro level, how many times during the year do teachers have to rework their plans due to a class being tossed out for an assembly or another standardized test? There is such rare beauty in a simple week with no special events, where teachers can just plan a course of instruction and actually implement it; so when new opportunities come up that would disrupt this, make sure they’re really worth it. Trust that unstructured time will be used well. I can’t make my point here without sounding a little dramatic, so here goes: If you’re not giving teachers regular time alone in their rooms, without micromanaging that time, you’re destroying their ability to teach. In a lot of cases, what teachers need is not more professional development, more collaboration with peers, or even more materials to work with…what they need is time, in their rooms, alone, to implement the things they have already learned to do. They need to concentrate. They need to not be interrupted. They need you to trust them. Especially at the beginning of the school year and the end of every marking period. Yes, some teachers may take advantage of the free time. They might socialize. They might fool around. Don’t punish everyone else for that. Deal with those teachers one-on-one and treat everyone else like the professionals they are. Which brings me to my next point. Instructionally, meet teachers where they are. In some schools, administrators require every teacher to turn in detailed lesson plans every week. For an experienced teacher who has proven her competence time and time again, this feels demeaning, as if her professionalism isn’t being respected. But some teachers might actually need to be checked on more often. Why require the same thing of every teacher? Why not require some teachers to provide more detail, while only asking others to submit a rough outline, or maybe not turn in any plans at all? And while we’re on the subject of lesson plans, how necessary is it to require that every teacher use the exact same lesson plan template? We all know that there is no universally agreed-upon format for a lesson plan, so why not let teachers choose the style that works best for them? Although this process will be messier than requiring the same thing from every teacher, it’s the same personalized approach our teachers should be taking with students. If the goal is to have everyone meet a certain standard of instruction, it just makes sense to honor the different path each person might take to get there. Address problems on a case-by-case basis. One of the most maddening things some administrators do is reprimand an entire staff for the transgressions of a few. In most of these cases, the vast majority of people being scolded have no idea what you’re talking about, but they start to wonder if maybe they did do something wrong without knowing it. It’s very confusing. When you then compound the problem by creating some new restriction or requirement for all teachers, when it’s just a few who aren’t doing what they’re supposed to be doing? This is just awful, and it tells the whole staff that you trust none of them. What would be so much better is if you just went directly to the people who are causing the problem and deal with them alone. Provide choice. One of the best professional development days I attended recently was done boutique style, where the schedule was broken into four 60-minute blocks, and teachers could choose between eight different sessions per block. Unlike other events I have seen, where all teachers are herded into a single room to listen to one speaker deliver one message, the teachers at this PD were energized and invested in what they were learning. No one rolled their eyes or scrolled furtively through their phones. They went to the sessions that applied directly to their work, and everyone got something out of the day. Obviously this required a lot of advance planning and might be more than any one school could handle, but the underlying principle is sound: Whenever you can give your teachers choice in content, process, or product, you’ll get better results. When I was in the classroom, my principal used to tell me all the time that I was a great teacher. It was nice to hear, but it didn’t mean much, because he almost never saw me teach. I asked him about this once, and he said that it was because he didn’t get any complaints about me. He said it almost as a joke, and to be fair, I do feel he knew my heart as a teacher, that he built his impression of me over several years of seeing the work I put in and how I talked about my students. But still. It would have meant so much if he actually knew what I was doing in my classroom. If he stopped by for five minutes, found something specific to compliment me on, and pointed it out to me later: The way I redirected a student respectfully, the fact that I asked good questions, the way my students really seemed to enjoy a particular part of a lesson or that he noticed what good writing they were doing. I know coming up with specific feedback is hard. Teachers get this; when we grade a hundred papers we can easily default to rotating between Good job! Excellent!, and Well done! We know how useless these are, and how much more meaningful it would be, how much more ACTIONABLE it would be if we pointed out something specific our students did well. So when we’re doing our best, we give specific feedback. That’s it. Something that small would go a LONG way toward making us feel seen and appreciated. I mean, a catered lunch every now and then is fantastic, but a meaningful compliment lasts a lot longer than a chicken salad croissant and some pie. 4. Regularly check in with your ego. Some of the worst mistakes I made as a classroom teacher could be traced back to me protecting my ego. I overreacted at times when I thought my students weren’t respecting me. I did stupid things so my students would think I was cool. I kept my mouth shut at times when I should have spoken up because I wanted my colleagues to like me. Ego, ego, and ego. If a new initiative was going to put more work on your teachers, would you opt out of it even if it would make your school look great from the outside? If you rolled out a new system or program, and it wasn’t going well, would you stop things and reassess, admitting that you may have been wrong, or would you press on despite the program’s ineffectiveness? When considering whether to give up some control with your staff, like no longer asking for them to turn in lesson plans, do you worry that it will make you look weak or that teachers will take advantage of you? When was the last time you asked your teachers to give you anonymous feedback on your work as an administrator? In all of your decisions, but especially the ones where you’ll be asking more from your teachers, take a few moments and see whether your ego is shouting in your ear. Sometimes you only have to recognize it to make it quiet down. These four certainly don’t cover everything. I haven’t mentioned how important it is to create a family atmosphere in your school, how teachers need your support with classroom management, or how much they appreciate it when you back them up with parents, but these four are big ones, the issues that come up over and over again when I see teachers who are truly feeling crushed by the weight of their work. Number 5 is not something that comes up in these conversations, but I think it’s something we should talk about. A lot of the factors that contribute to teachers’ difficult working conditions may seem to be out of your control. The decisions come from above your head and you just have to go along with them; after all, you want to keep your job, too. But ask yourself this: When policies or norms that impact teacher workload come down from above, and they aren’t working, and they ultimately don’t serve kids, whose responsibility is it to communicate that to those in power? You have the ear of the superintendent, at least more than the average classroom teacher. Is it possible that you could be the vanguard in reversing some of our biggest problems in schools? Could you say to those above you, This isn’t working? Could you join forces with other administrators, tell stories to make the decision-makers understand, and then tell them again? Maybe you’re already doing this. Maybe I’m just revealing my ignorance of how these things work. I’m just going on a hunch here. But it’s a hard hunch to shake: You stand right in the middle, wedged between those who make the policies and the teachers and students impacted by them. I addressed this letter to school administrators, but an administrator just administers programs and systems created by others. By taking this last step, going beyond administering and working to create real change for your teachers and students, that would make you a leader. And if you choose to be a leader instead of an administrator, your influence could be tremendous. I love your blog, and now I love it even more. YES re: needing time alone in our classrooms., without something new to tackle. We fight for students to experience the flow of unstructured time. Why do I feel it so infrequently? I can’t tell you how reassuring it was to read this, tonight of all nights. Thank you for being the voice I really needed now, and for your wisdom and humor all the time. I am so sharing this with my colleagues and even my union. We battle this every day, and your words put the challenge to our admin in such clear, precise, and motivational words…they should be able to hear our cry. If not, at least we tried. Thank you for taking the time to put our feelings into kind considerate, yet powerful, words! I am retiring 3 years earlier than i planned, just for these reasons. I wish that they would hear us. You hit the nail on the head FIVE TIMES. So well-written. I am going through a struggle right now involving all of the above! Thank you for expressing just what I am experiencing in such a fair and detailed way. thanks a lot for the covering. I felt myself heard. I felt myself saying out loud those requests. Not to mention fear I actually have to share it with my superiors, I belive they must hear us! Thanks again for trying to make our lives as a teacher, a bit easier. Just…wow. When I think your articles can’t get any better, they do. Thank you for all the time and thoughtfulness and truth you put into this. As a veteran teacher of almost 30 years, your insight is incredible! Each year I find myself looking for valuable MINUTES to do quality planning to prepare for my lessons. So many things have been put into our backpacks over the past 10 years and nothing taken out. It is a sad scenario that so many administrators very quickly forget the demands of being a teacher and understanding that most of us love teaching and would like to get on with the task of being a better teacher and not a paper pusher (on-line). I wish this could be sent to all administrators. Thank you. Great timing for this letter! We were told that for the first ten days of school we had to eat lunch with our students so we could “bond” with them. We also have a new reading program that was handed to us a few weeks before school started. It’s so overwhelming, we all feel like we can’t do this. Morale is down already! The problems in education seem to be complex, but it really comes down to a few basic issues. They are the “elephants” in the room that only a handful of educators (teachers) want to address, while most in positions of power (administrators) want no part of the conversation. I will simply list the issues for now and wait to see if anyone else is ready to come out of the shadows. Too much technology…..Too much emphasis on testing & data…..Catering to the college bound….Lack of acknowledging dysfunctional family impact on students…..Allowing individual differences from teacher to teacher, department to department…….”Ignoring the boring” basic fundamentals, hats in class, dress codes, putting trash away properly, common courtesies! Etc. These are just a few, but the truth of the matter is about putting children ahead of money related issues and promotions. When schools became businesses, we failed our students and communities. As an administrator in a small Christian school, I resonated first with your paragraph acknowledging that you understand some of the different pressures that we administrators face. But I was able to remember being a teacher in the classroom and your advice also resonated with me. Thank you for courageously being a voice for teachers! As an administrator, I relate to your comment Tim. The article is not an eyeopener as I was a teacher with similar issues but a reminder to reassess decisions taken for the benefits of the teachers and in extention the students. Great article. Even with a teacher’s union at our disposal, it’s hard to get support for attacks from within the rank and file. The vast number of highly qualified teachers who were forced out of the profession even though they were able to do what ever needed to be done otherwise. As an administrator, I appreciate this. Just this past week, I met with my leadership team, and many of the points you referenced (specifically dealing with time and meetings) were discussed. I haven’t been doing too well with respecting my teachers’ time. And, I get it. You hit the nail on the head, that administrators stand in the middle of what the policy makers want us to do and the impact that those decisions have on teachers and students. I was convicted by my team at that meeting, and I am convicted by reading these words here. Check your ego at the door – yep! How has things improved since your change? Any progress on this? Curious to hear. I taught kindergarten and have now retired. We were a high poverty school with students who were so often not given any encouragement or help at home. We were pushed to get our school grade up quickly. We had to push, push, push kids who had few basic skills. There were 2 of us teaching kinder. I had no help in my room. The other teacher had her husband helping her in her room. He took care of attendance, any money transactions, pulled workbook pages and put them in order. He handled centers while the teacher did individual/small group, helped grade papers, put papers together to take home. He also made copies many times. Our admin knew he helped that teacher, but still wondered why I couldn’t get everything done that she did as quickly as she did. That truly hit me hard. I’m not a teacher per se, but a dad of a teacher who loves her profession and involves me in her experience. I thoroughly enjoyed your five suggestions to school administrators with respect to their relationship with teachers as I believe “healthy relationships” leads to “emotional wellness” professionally and personally–and “healthy relationships” with our students–and ultimately “peak teaching and learning performance.” There’s nothing like a happy, fulfilled teacher. Happiness seems to be the secret motive of all we do and of all we are willing to endure. Thank you. I am profoundly grateful to you for your depth of insight! The entire letter is completely on point, but when I got to number five, I thought you had a magical power to read my heart and mind. I posted comments to your request for ideas on Facebook, and admire your ability to synthesize the myriad issues relating to the of the complexities of teaching, and then poignantly speak for the whole of the profession. I am moved and heartened by your voice. Oh this rings a bell! I have only been in secondary education for Two years, after a decade in higher ed- the lack of respect from Administrators and ‘the front offices’ is beyond humiliating fo adults to have to go trough. Paper and other supplies passed out to favorites or just hoarded in cabinets, custodians having to even buy their own supplies. Thank you! I have just shared your blog with my entire administrative team. Much appreciate the words of guidance and wisdom! The lesson plans…. the hours I spend preparing them for the principal, not for teaching…those teaching plans are written in the margins, underlined and post-ettes through out the teaching manual. Why anyone thinks copy and pasting a teacher manual into an electronic lesson plan is a good idea, is beyond me? I’m feeling foolish as I sit here in tears over the truth in these words. Sometimes I feel like my expectations are too high or that I’m a bit crazy for wanting something better. After 20 years of teaching, I feel like it shouldn’t be this hard. My students are amazing people but their needs are many, and I have to keep reminding myself to breathe just to get through each week. It’s only September and I AM SO TIRED! I know exactly how you feel. After almost 25 years of teaching, it Does not get easier. . Hang in there, and I will too. Terrific podcast! I shared it with my admin team and will share with teachers during PLC time. Points in the podcast are well taken. An open line of communication is key though. Principals and teachers are in the same arena, or at least I have always thought so. If you are frustrated walk in the principal’s office and say “here is why I am frustrated”. It seems education becomes more and more of a political football and we are all held to any number of mandates causing our “initiative fatigue”, both teacher and administrator. “New and improved” is the nature of the business that seems out of local control at this point. Some good, some not so good. Good administrators know the difference between essential information that must be shared and nonessential information that interferes and frustrates teachers. As a special educator the part about differentiating how admin works with teachers was especially salient. It makes sense. The only time I had to turn in lesson plans I didn’t have a problem because I was developing new units and what not and was a younger teacher, but if I was a veterano I would probably be looking for that differentiation that you discuss. In my opinion you came with many prejudices into the topic. I dont think its been always the school administrator for letting teachers in such bad conditions, my perspective tells me the exact opposite and here is why, If teachers are giving great lessons they should keep up their work but here is the twist when it comes to responsibilities, parents mostly go straight into the issue and thats fine you can learn something out of it even if it was a mistake. The teachers and students nowadays are corrupted and blinded by the society itself if we come into a problem then it will be because we are all in the circle we educate ourselfs because we tend to make ourselfs better and since we[humanity] failed to do an actuall pedagogy it is hard to tell, the concept of this world isnt the same as it was before, i lost students at my age because they could understand how bad the situation was and how bad they got treated by family and school itself and if its “ONE THING” you should really put in your mind, it should be the fact that mental illness has just spread, whether it comes from the poor education of the parents or by the social media, i honestly cant help this world with words but by using my time and effort on helping those teens at my age to develop themselfs as im doing right know. From what we started it is the source and approach to maintain the core. Im not here to judge but to bring Narcissistic complaints out of this. This was a wonderful piece that was actually very fair to administration. In 14 years of classroom teaching I have experienced excellent, mediocre and toxic administrators. You show a great deal of sympathy for their workload, perhaps too much. Every administrator I have met claims to work much harder than they did in the classroom, and that the hours are insane, but none ever want to go back! If I was was to be honest, I am jealous of the additional money they make with less work and accountability than the average teacher (could you ever imagine blaming your scores on poor leadership?). I find some admin positions irrelevant, or even destructive as they create work to justify their position. Put it this way, an average size high school of 1500- 2000 could easily remain open and functioning if 50% of the administration did not turn up for work. I mean, are there substitute administrators? The same could not be said for the teaching faculty. I can imagine this sounds bitter – but I am beginning to think that a great deal of “ed leadership” is one massive boondoogle that human resources and universities use to raise funds and justify high salaries for unnecessary positions . I would share website this with my own school leadership -it would not go down very well with them – just posting it on facebook is dangerous. You have some good points, but the big one for me is tell me exactly what it is you want me to do, and then give me the time to do it. I appreciate how you said that instructional time is important and that standardized testing can interfere with that. The nice this about assemblies is that you could potentially get something that will help you with the instruction you are working on. Getting an elementary school science assembly, for example, could be a good way to push home the ideas you have been teaching your students all year long. This is a wonderful article and so well-written! I feel as though teachers can read it and think about it in terms of leading their students, also. These five goals would apply in that relationship as well. Thank you! Kara, we so appreciate you sharing this with us! I loved this article! It reminded me of the wonderful administrators I’ve had over the years and I how much I admire them for how instinctively they know how to earn teachers’ respect and loyalty. *The only thing I would add is that if you use a tool such as Voxer, you STILL need to be respectful of teachers’ private time. There is nothing worse than finally getting to sit down with your family at night or finally getting to sleep in on a Sunday morning and getting non-stop Voxer alerts from your principal. And yes, that really happened. I love this article it has lots of great points! I will definitely be sharing this with my grade level and my union. Thank you for sharing such a great article! Glad you found it helpful, Irma! I really like your post. Keep up the good work admin.